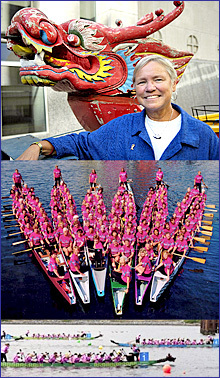 Not many revolutions in medical thinking have been driven by fleets of dragon boats rowed by female cancer survivors. But tests of such an unlikely form of therapy in 1996 led to what has become today's new approach to upper body rehabilitation after breast surgery and radiation treatment. Susan Harris, PhD, PT, Professor Emerita of Physical Therapy at the University of British Columbia and breast cancer survivor was one of the earliest proponents of therapeutic dragon boat racing. Since 1996, the organization 'Abreast in a Boat' has established cancer survivor racing chapters throughout much of the world. Beyond that, the work of researchers like the University of Pennsylvania'a Kathryn Schmitz suggests these discoveries about the benefit of vigorous exercise may have implications for cancer patients in general. Breast surgery and radiation treatments can damage the lymph system in a manner that can cause lymphedema, a chronic and sometimes painful buildup of fluid under the skin of the arm or shoulder. Until three years ago, many physicians routinely warned patients with this condition to avoid carrying anything or lifting anything heavier than 5-15 pounds -- ever again. "Rest. Take it easy. Don't push yourself" was the advice that sentenced cancer survivors to a physically limited life. But sometimes the prevailing medical wisdom is based on the best science at the time and other times, it's based on the best science of a previous time. And sometimes, as Susan Harris, Professor Emerita of Physical Therapy at the University of British Columbia and breast cancer survivor said in 1996, it is based on something more akin to "folklore." She became one of the visionaries who challenged the taboo against exercise by using the strenuous upper-body demands of dragon boat racing as an exactly opposite therapy. It worked and now has the science to prove it. Today, the new emphasis is not on what physical activity breast cancer survivors should avoid, but on how to deliver an individualized exercise program that can restore upper body function and a vigorous life. Penn's Schmitz, an Associate Professor of Epidemiology, has played a central part in this still-unfolding story. She noted that traditional clinicians were not trying to hold women back. In an earlier era, when cancer treatments were so toxic and cancer was so deadly, the advice to avoid physical exertion was reasonable. "If you think [patients] are going to die, and they need to save their strength for fighting the cancer with chemotherapy and radiation and surgeries and for dealing with the physiologic and psychological stresses of undergoing those toxic treatments, it makes perfect sense," she said. Kathryn Schmitz, PhD, MPH, Associate Professor of Epidemiology at the University Pennsylvania continues to research the therapeutic benefits of strenuous exercise for cancer patients. the prevailing wisdom regarding exercise didn't shift. "Back then, it would have been heretical to simply say, go, do, you should be active," she recalled. One early "heretic" was Don McKenzie, MD, PhD, a sports medicine physician and exercise physiologist at University of British Columbia. In his practice, he encountered breast cancer patients who were afraid to do simple exercises because they had been told it would cause or increase the likelihood of lymphedema. McKenzie believed that exercise could be beneficial to cancer survivors, and set out to prove it. He recruited Harris, a colleague, and 23 other breast cancer survivors to form a dragon boat team in February 1996. They named it "Abreast in a Boat" and it began to change the way breast cancer survivors live. Dragon boat racing involves 22-26 paddlers propelling a 38-48 foot craft along a race course of about a third of a mile. It requires strenuous, repetitive upper body activity. "They were doing exactly what the 'letter of the law' said they shouldn't," Schmitz noted. Many of the women had current or prior lymphedema, and almost all were at risk for lymphedema. They were mostly novices to the sport and participated in a two-month training program of progressive stretching, strengthening and aerobic activities before they ever hit the water. Then they spent three months learning technique and timing through twice weekly on-the-water practices. The team competed in Vancouver's Dragon Boat Festival in June 1996, and continues to this day. The women reported marked improvement in physical and mental health. It spawned an international movement, with more than 150 Abreast in a Boat teams formed worldwide. But McKenzie and Harris knew that changing the prevailing wisdom would take more than a successful dragon boat experience. Harris took careful arm measurements of the participants before, during and after training and found no increase in lymphedema. In 2000, she published her findings in a series of case reports and entitled her article "Challenging the Myths of Exercise-Induced Lymphedema." It was a small study, it was not rigorously controlled, but it was a start. 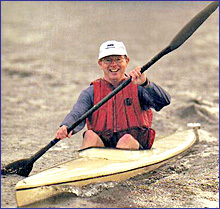 In the 1990s, kayak enthusiast as well as sports medicine physician Don McKenzie set out to prove that breast cancer survivors shouldn't be limited in their physical activity. He launched the first dragon boat experiment. 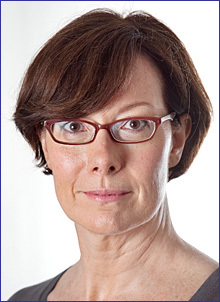 McKenzie, MD, PhD, is an exercise physiologist at the University of British Columbia. epidemiologist, she was interested in the links between obesity, heart disease and physical activity. In 2001, she received funding from the Susan G. Komen Foundation to test whether twice-a-week progressive weight training would reduce a particular biomarker thought to be related to cancer recurrence. For her, breast cancer survivors seemed like a good target population for her efforts. The oncologist on the study told her to exclude patients at risk of lymphedema, a condition she knew nothing about. Following this advice, she found that she could not recruit enough women to conduct the study. She started to wonder about the need to exclude these women, and spent three weeks combing this literature. She found a few "little pockets of thinkers" who were beginning to challenge the prevailing wisdom. "I found the start of the idea, maybe it is safe. There was enough in the research world that said... it might be safe in a controlled setting of a research study." She called Susan Harris, and after consulting with her and other lymphedema therapists around the country, came up with the protocol for including women with lymphedema in her study. Ironically, the study found no effect of exercise on the original outcomes of interest. "Science is fickle," she laughed. But she ended up with the largest (45 women) and longest (six months) trial at the time of the effects of exercise on breast-cancer related lymphedema. "What we found was completely contrary to the prevailing wisdom and what the guidelines said. Progressive upper body resistance training was perfectly safe for women with and at risk for lymphedema." The study was published in June 2006, and the New York Times did an article about it. Schmitz began to get calls and emails from cancer survivors across the country, wanting to know how to get into the program. But she had nowhere to refer them, because the program had been part of a controlled study that had since ended, and the trainers were research staff who had gone on with their careers. "And that's how my whole tale starts of trying to change the world," Schmitz said. Watch a 2:26-minute excerpt from the 2010 movie, 'In The Same Boat' featuring Don McKenzie and some 'A Breast in a Boat' crew members. that. First, she obtained funding for the Physical Activity and Lymphedema (PAL) study, a larger (295 women) and longer (one year) randomized trial of weight lifting for breast cancer survivors. "PAL was designed to put the last nail in the coffin of the prevailing wisdom with lymphedema," she said. The program included a gym membership (usually to a YMCA) and 13 weeks of supervised instruction, with the remaining 9 months unsupervised. The results were striking and unequivocal: the program was not only safe, but reduced the risk of developing lymphedema in women at highest risk by 70 percent. Women with lymphedema who exercised had fewer symptoms than the control group, and half as many flare-ups requiring therapist delivered treatment. Schmitz published her findings in the New England Journal of Medicine and JAMA in 2009 and 2010, and the world began to change. Slowly. New guidelines in 2009 and 2010 suggested that clinicians advise their patients to "avoid inactivity" both during and after cancer treatment. Schmitz is not satisfied. "It's not enough to say you should go out and exercise," she stated. Exercise is medicine, she explained, and should be prescribed as precisely as other types of medical treatments. "Your doctor doesn't give you a prescription for medicine. [For blood pressure] your doctor gives you a prescription for propranolol 10 mg once a day... and knows, with great specificity and confidence, that there will be a place for you to go to do this." Specificity. Infrastructure. Schmitz has taken this on as a mission. "I'm not done. I've got four more good decades in me." She sketches out a future when exercise will be integrated into cancer treatment and rehabilitation. Upon diagnosis, she foresees, the oncologist will prescribe a consultation with a cancer exercise specialist, who will design an exercise program to help a woman get through treatment, and may help improve survival. After treatment, seamlessly, the woman will go back to the cancer exercise specialist and physical therapist for further evaluation, and enter a stepped care program, similar to cardiac rehabilitation. How does this vision of effective health care turn into reality? Schmitz and colleagues are now implementing and testing an exercise program for breast cancer survivors in real-life settings. They have adapted the PAL intervention to create the "Strength After Breast Cancer" program in 6 or 7 locations in Philadelphia. In a follow-up visit, oncologists refer breast cancer survivors for a standardized physical therapy evaluation (and treatment, if needed) of arm and shoulder problems. Survivors attend a one hour educational session and four group physical therapy sessions (or one-on-one therapy if necessary). They learn how to exercise safely and leave with instructions for continuing to exercise at home. "Any time you set up a clinical program, it's like learning to drive a stick shift. We're figuring out the bumps," Schmitz said. She had little trouble obtaining buy-in from the oncologists and the physical therapists. After much negotiation, the physical therapists with whom she works convinced insurance companies to cover the PT evaluation and sessions, subject to copayments and deductibles. "It's not free to women... the program is deliberately set up as a clinical program would be." The oncologists have been enthusiastic and have referred 250 women in six months. The big surprise, Schmitz noted, is that only a quarter of the women referred into the program follow through. "Patients don't understand why they need it. The ones who participate say that the program saved their life, that their quality of life is better, that they can do things they could never do before. The idea that if you build it they will come... is not accurate," she concluded. Schmitz sees the need for patient education and an opportunity for further research. She wants to understand the subset of women who participate, as well as those who refuse. "Some women say they're already exercising, or that they've already been through PT. Is it cost, location... how do we get them to do this?" she wonders. At the same time, Schmitz gets a call a week from people and institutions interested in her program. For example, she has been to California this winter to do a training and now the program will also be implemented at the University of California in San Francisco starting this spring. "There's a business opportunity here... but I'm not a businesswoman." Despite this caveat, she offers a vision of the future based on economies of scale: "Ultimately, broad access to good quality rehabilitative exercise programming for cancer survivors won't happen by just focusing on one late effect of one cancer. What about other cancers and other chronic conditions? How about re-creating cardiac rehabilitation centers as multiple chronic condition rehabilitation center? Could we partner with cardiac rehabilitation companies to do this? Schmitz envisions a shared resource serving multiple populations. "Put them all in the same place. The people who know how to do this -- physical therapists, nurses, clinical exercise physiologists -- they're all the same people. Currently, these are the staff at cardiac rehabilitation centers. How do we make this happen? I am on fire to make this happen."